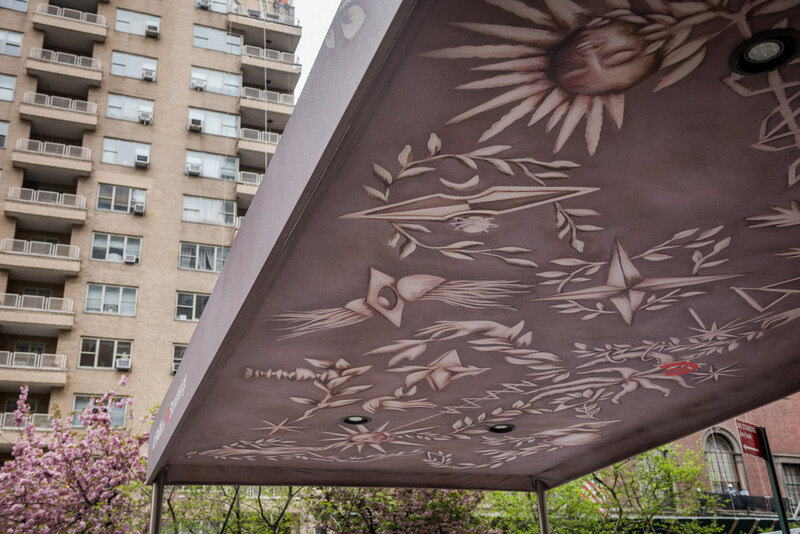 Stonehenge NYC, a leading real estate company in Manhattan, and renowned visual artist Ara Starck, have joined forces to create and introduce one-of-a-kind celestial themed canopies, titled “Stonehenge Stellaris,” for two of Stonehenge’s properties. The canopies will first be unveiled at 41 Park Avenue and 20 Park Avenue, followed by an exclusive event celebrating the collaboration. The Stonehenge-Starck collaboration will transform Stonehenge’s building canopies into unique works of art highlighting the company’s portfolio. With 23 properties located throughout Manhattan, each building’s character and identity contributes to Stonehenge’s unique portfolio. The canopies will draw a parallel between Stonehenge’s properties; connecting the buildings with the streets they inhabit using the streets themselves as the canvas. Stonehenge’s mission is creating community through hospitality – welcoming residents into a home perfectly tailored to their tastes and needs. Stonehenge’s lifestyle division hosts over 100 complimentary events annually for their residents ranging from wine tastings to comedy nights. By offering more than just a place to live, Stonehenge enhances the resident experience and connects its community throughout Manhattan. Drawing upon Stonehenge’s ideals as inspiration, Ara Starck composed an invented constellation, a phantasmagoric map to connect the members of the Stonehenge family situated around New York City. The canopy is not only a piece of art but an instrument that grounds and brings comfort while transmitting fantasy and an appetite for discovery. “I was introduced to Ara Starck through Culture + Commerce and immediately knew that Stonehenge NYC and Ara needed to work together in some capacity. She is a brilliant artist who understands how intertwined our city is with art. She shared our vision of using building canopies to tell a story of our properties located throughout Manhattan. We look forward to expanding this collaboration to our other properties and working with her for many years to come,” said Eyal Reggev, president of Stonehenge NYC. “Our buildings boast condo-level renovations, high-end amenities and top-of-the-line service. It felt only fitting that we showcase that quality and attention to detail to the public. These building canopies tell a story that illustrates the foundation of our brand: to provide our residents with the best living experience possible. When you live in a Stonehenge NYC building, you become part of our unique and rewarding community that is impossible to find elsewhere in this city,” said Ofer Yardeni, chairman and CEO of Stonehenge NYC. The canopy is the first thing that welcomes residents home and the last thing residents see on their way out into the city. As such, Ara found a great deal of inspiration in the canopy in and of itself, identifying the concept of the canopy as carrying the quality of being protective, acting as the tie between the safety of home and the outside world. The canopies will launch officially in May with an event at Stonehenge’s 41 Park Avenue property. Additional canopies are planned to be added throughout 2017. About Ara Starck: Ara Starck was born in Paris in 1978. After spending time at both the Ateliers de Sèvres and the Ecole des Beaux Arts in Paris, Ara studied at Central Saint Martins College of Art before graduating with a B.A. from the Slade School of Fine Art in 2002. Ara has always been inspired by the idea of transcendence, literally and figuratively, and sees her choice of working in the medium of very large formats as an essential driving force. Working within the framework of traditional painting techniques such as oils, brushes and turpentine, Ara creates works that are encounters. Her stated ambition is to create a third material, an alchemy of the canvas unique to both artist and viewer. Ara has created works for the legendary Hotel Meurice in Paris, the Palazzina Grassi Hotel in Venice, Baccarat, the winemakers Terra 6840, the SLS Hotel in Miami, Kong Restaurant in Paris, Flavor Paper and the Hotel Haitza in France, to name just a few. She lives and works in New York.